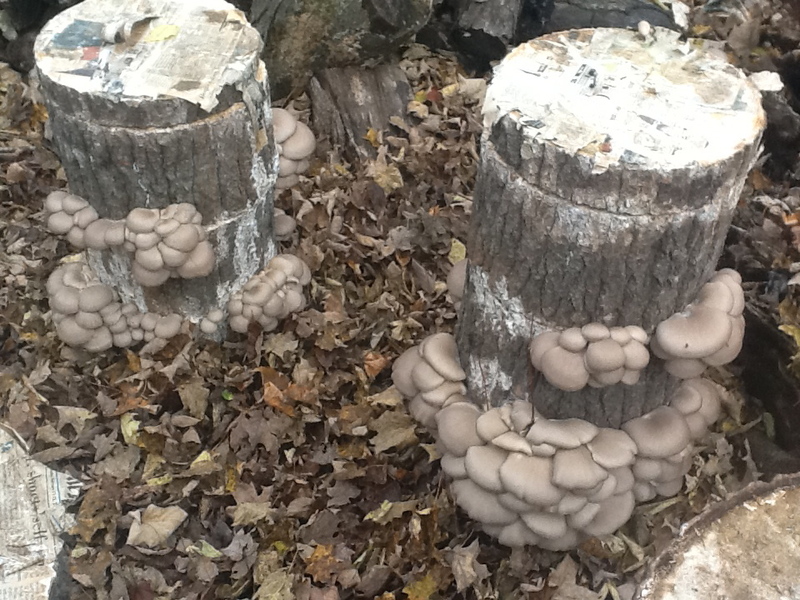 In 2012 I learned a new technique for oyster mushrooms from the folks at Field and Forest. It’s done using large diameter logs cut into 6-8″ lengths and stacked, with a ‘top plate’ about 2″ thick. It’s called the ‘totem method.’ Spawn is layered between the rounds and the totem is kept moist, one way or another, for as long as possible. I cut these rounds with the help of forester/logger Robert Spring in early spring, and inoculated and stacked them. In October they started blooming. So far I have sold batches to the Whetstone Station restaurant and brewery, and the Putney Food Coop. Anyone who has cultivated mushrooms will tell you that different strains of the same mushroom can have very different characteristics. This variety is called ‘grey dove’ (Pleurotus ostreatus) and is known for being reliable, prolific, tasty and sturdy; all great characteristics for a culinary mushroom. They do not keep nearly as well as other varieties of culinary mushroom, though, so it is important to harvest and get them to market quickly. The more I work with fungus the more amazed I become with this kingdom of organisms. There are varieties here in New England called Jack O’Lanterns that glow in the dark, and varieties in Oregon that grow under water in cold, fast flowing streams. Oyster mushrooms are used to remediate toxic waste that is organic in composition, such as petrochemicals. See my page on remediation for more on this.